Diplomatic crises between Turkey and Israel in recent years have the well-known scenario: public insults of diplomats in front of the TV cameras, exchange of belligerent statements from senior officials on both sides. However, neither side is eager to repeat the situation of 2010, when the incident with the "Gaza Freedom Flotilla" led to the break-off of diplomatic relations between Israel and Turkey. After recent events, related to the decision of US President Donald Trump to recognize Jerusalem as the capital of Israel and transfer the American embassy there, Turkey among all other Muslim countries became the most ardent opponent of these steps. President Recep Tayyip Erdogan, exploiting the status of Turkey as the chairman of the Organization of Islamic Cooperation, gathered twice in Istanbul extraordinary sessions of this international organization (in December 2017 and in May 2018) in connection with Donald Trump’s statement about Jerusalem, and bloody clashes between Palestinian demonstrators and the Israeli army on the border with Gaza, when the US Embassy in Jerusalem was officially opened on May 14. Ankara, unlike other countries of the region, withdrew its ambassadors from the US and Israel in protest against the actions of the Israeli military, which caused heavy casualties among the Palestinians. It is not the first time in recent years, that the Turkish leadership became an active supporter of the Palestinians, sharply criticizing Israel as a "terrorist state" and calling upon Muslims of all countries to unite in joint actions against the "occupation policy of Israel." A great concern for the Israelis is the strengthening of ties between Turkey and Hamas in Gaza. This new turn in the Palestinian problem seems to reinforce Turkey's desire to take the leading role in the Middle East arena, to create some axis of the Muslim Brotherhood adherents in cooperation with Qatar and Hamas in opposition to the consolidating Sunni nucleus Saudi Arabia-UAE-Egypt. Moreover, President Recep Tayyip Erdogan clearly exploits the theme of Muslim Holy places protection in Jerusalem in desire to become the leader of the Islamic world. For several years, the Turkish Directorate for Religious Affairs conducts special pilgrimage programs to Al-Aqsa mosque, which increased the number of Turkish tourists visiting Jerusalem. According to some reports, number of Turkish pilgrims increased from 10-15 thousand in 2014 in to 40 thousand 2017. The Palestinian unrest around the Temple Mount in summer of 2017 was immediately used by the Turkish leader for the most harsh statements and accusations against Israel. Diplomatic crises between Turkey and Israel in recent years have the well-known scenario: public insults of diplomats in front of the TV cameras, the exchange of belligerent statements from senior officials on both sides. 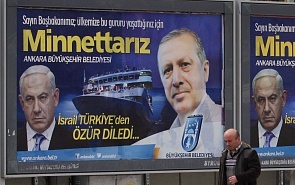 However, neither side is eager to repeat the situation of 2010, when the incident with the "Gaza Freedom Flotilla" led to the break-off of diplomatic relations between Israel and Turkey. For Israel from the first years of its existence, Turkey as one of the largest Muslim states in the Middle East, was an important partner in the policy of the "peripheral alliance", led by David Ben-Gurion. Throughout all these years, ties in the military, political, economic, and civil spheres were beneficial to both countries. In 2017, the total trade turnover between Israel and Turkey was $ 4.3 billion. Because of war in Syria, Israel became a transit route for Turkish cargo to Jordan: about 30-40 trucks are weekly unloaded from ferries in the port of Haifa in order to follow Israeli territory to Sheikh Hussein's bridge to the neighboring Arab country. In air transportation, thanks to the agreement with Turkey, the Israelis use cheaper transit tariffs and services at the Istanbul airport. This mutually beneficial cooperation was not interrupted even during periods of serious political confrontations between the two countries. The sharp rhetoric of president Erdogan against Israel in connection with recent events in Gaza and the transfer of the American embassy to Jerusalem is probably also caused by his election campaign (early presidential and parliamentary elections in Turkey are scheduled for June 24). But the foreign policy of the Turkish president is characterized by a high degree of pragmatism, rapid assessments change of the international and regional situation, if national interests require to do so. Thus, Ankara welcomed recent US missile strikes in Syria, although, at first glance, this contradicts its position as a participant in the peace process, conducted jointly with Moscow and Tehran. Apparently, Turkey, while remaining a member of NATO, expects to get the American support to resolve the problem of Syrian Kurds, which is the most important for Erdogan. As to relations with Israel, for Turkey it will be important how the benefits of cooperation with it, including the economic one, outweigh the lack of mutual understanding on many regional problems.